HelpNDoc is a Windows-based help authoring tool published by French company IBE Software. 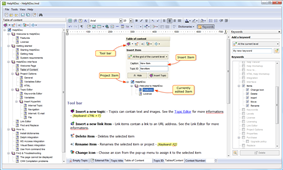 HelpNDoc allows the writer to create a OpenOffice.org Writer. This editor is backed up by a table of content and keyword editor. The overall look of the application closely mimics the final CHM output display in the Microsoft HTML help viewer. To create CHM help files, HelpNDoc generates intermediary files and relies on Microsoft's HTML Help Workshop to generate the final help files. Other formats are natively generated by HelpNDoc. The major focus of HelpNDoc is the ease of use for the end user. This is why most of the application is available through the main window, with a minimum of dialogs. HelpNDoc has the ability to include variables and external files. It also has the ability to generate code for the C++, Delphi, Fortran, Pascal and Visual Basic programming languages to ease the integration of the generated CHM help files with the application being developed. HelpNDoc's licensing model offers a free version of the program for personal use, and two paid versions (Standard and Professional editions) for commercial use. The free version includes a discreet ad at the bottom of each generated documentation page while the professional edition doesn't. The standard edition only displays those ads at the bottom of RTF and PDF generated documentation. ^ "HelpNDoc.com Site Info". Alexa. Retrieved 20 July 2013. ^ a b c "Need Assistance in Building Help Files? HelpNDoc can do that". Softpedia. 12 July 2006. Retrieved 5 June 2009. ^ "Help me if you can" (pdf). Boston Broadside. March 2009. Retrieved 5 June 2009.